At least 19 tornadoes have struck the mid-US this weekend damaging homes and causing blackouts, according to weather channels. 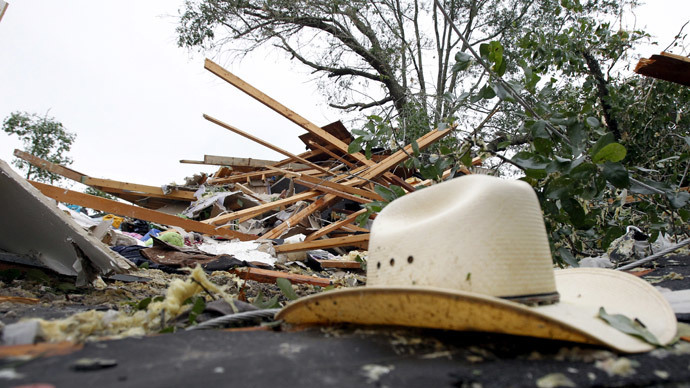 The worst affected states are Oklahoma and Texas, which were hit by hail and destructive storms. Minnesota, Oklahoma, Texas, Missouri, Kansas, Nebraska, Wyoming, Iowa and Louisiana have all witnessed the wayward and harsh whims of May’s weather. A tornado touched down near the town of Ogden in Iowa, on Sunday. On Saturday, a “multi-vortex” tornado hit southwest of the towns of Murdock and Rosen in Minnesota on Saturday. Broken Arrow in the northeastern part of Oklahoma also reported a twister, which caused structural damage and power outages in the area. A separate and large tornado struck southwestern Oklahoma. “Elsewhere in Oklahoma, tornadoes were reported 9 miles [14 km] south of Anadarko, near Meers and Elk City along Interstate 80,” the Weather Channel said. Homes and power lines have been damaged following the severe weather in Oklahoma. The Department of Emergency Management reported over 3,000 power outages there. "We've gotten a lot of rain in a short time. The ground is saturated, so every time we get another big soaking, the rain causes more flash flooding," spokeswoman Keli Cain said. "We are seeing pockets of damaging winds from Missouri south to northeast Oklahoma," Bill Bunting, chief of operations for the National Weather Service Storm Prediction Center in Norman, also told AP. "It's a very strong upper level disturbance." US Highway 283 in the town of Elmer had to be shut down due to a fallen power line, the Oklahoma Highway Patrol reported. Texas was not only again struck by tornadoes as in the previous week, but also received a battering from some “baseball-sized” hail. Heavy rains and winds are still whipping across parts of the Lone Star State, as well as drenching and buffeting Kansas, Nebraska and Minnesota, who may see some more tornadoes on Sunday.